Brainiac attacks I'Noxia while Kara Zor-El has become a part of the inhabitants' collective consciousness. She is in the form of herself from childhood. Cyborg Superman has shed his armor to reveal that he is Supergirl's father Zor-El. Brainiac wants the Maid of Might alive to study the effects of Kryptonite poisoning. Meanwhile, the Girl of Steel is on a rampage looking to return to her body. Yet, the I'Noxians and Zor-El, who was changed or created by Brainiac, defy him. 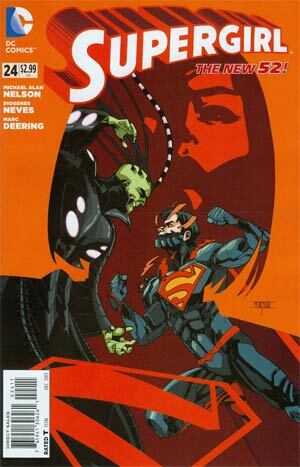 Plus, Zor-El, shamed by what he's done to Kara, wants his memories erased in order to become the Cyborg Superman again. Only Delacore can do this for him. With Brainiac's forces closing in on I'Noxia and an angry Supergirl demanding to be corporeal again, Delacore may just have his work cut out for him. Brainiac's drones continue their assault. Kara has broken free from the I'Noxian collective. Delacore is working desperately to make Zor-El the Cyborg Superman again. He has also promised to do two things. First, make certain Supergirl never knows the Cyborg Superman's identity. Second, Cyborg must have memories altered to believe that Brainiac prevented the surgical procedure to restore him to his form of Zor-El. Once the Cyborg Superman returns to his armored self to deal with his creator Brainiac, Delacore brings Kara back to her body. He and the I'Noxian collective become a silver sphere while Supergirl leaves on the KR-1 Spacecycle to search for happiness as Delacore suggested. However, all the Lost Daughter of Krypton finds is the monolithic Oracle, who was last seen in "H'El on Earth". Story - 4: In all honesty, we have a story that merits a five. Yet, the waiting for the next issue (due "Villain's Month") disrupted the flow of Nelson's entire arc for me. Don't get me wrong. It was a good concept and well done. However, titles that weren't involved should have gone on with their normal monthly schedule in my opinion. I'm torn regarding Zor-El being the Cyborg Superman. On one hand, It is an interesting twist. On the other, part of me wants Cyborg to be someone else. Zor-El would work if he was a manifestation created by the Cyborg from Kara's memories. Still, the overall issue, and the entire story arc for that matter, has been great fun to read. I look forward to reading more of Michael Alan Nelson's run. Art - 5: The art is continuing to grow on me with each passing issue. Diogenes Neves is really doing Kara's universe justice after having such a hard act to follow in present cover artist Mahmud Asrar. The images just leap out at the reader as the story progresses. Cover Art - 4: We have yet another image that seems influenced by Mike Mignola. It feels like Mahmud Asrar tried to put too many things in it. Still, it's a fantastic cover in spite of that.